Owner Daniel Meyer, from Switzerland, fell in love with the Texas Hill Country on a U. S. trip in 2006. 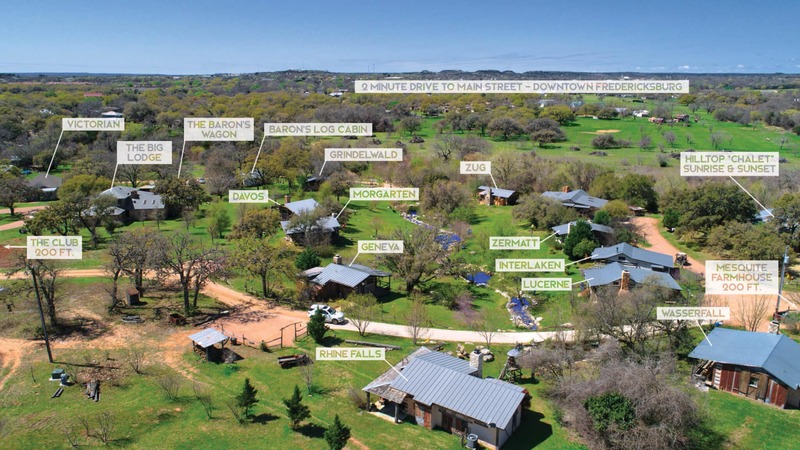 He spent one Fredericksburg night in what is now The Barons Log Cabin, and decided to buy the entire 26 acres and create his own Swiss Log Cabin village on what was then a undeveloped pasture. First, he built a continuously-flowing Alpine-style creek including a waterfall, thousands of hand-placed boulders and rocks, recirculating the well-water. Secondly, he planted more than 150 native Texas trees and renovated the existing Hilltop Chalet, Big Lodge, Victorian, and Mesquite Farmhouse. And then he began the meticulous job of building his own Swiss Log Cabin village right in the heart of the property along his beautiful, bubbling mountain-style creek. Using the historic elements of his own 250 year-old Swiss farmhouse, and finding the most talented Texas cabin builder Joey Johns as well as actual Swiss craftsmen, he set out to build his dream village, one cabin at a time. Daniel owned the large Swiss farmhouse in scenic Lucerne that was condemned for demolition. He had the historic windows and doors carefully removed and placed in two 40-foot shipping containers bound for Texas. From these 250 year old doors, windows and antiques he created the individual cabins named Lucerne, Interlaken, Zermatt, Geneva, Wasserfall, Rhinefalls, Grindelwald, Morgarten, Davos. His own cabin is called the Zugerberg, and in the spring of 2016 the “Zug” – the very most exciting Swiss log cabin was completed. The Log Cabins are perfect for couples focused on romance and re-connection. We are THE ROMANTIC GETAWAY in the Hill Country and perfect for honeymoons! The four family houses are loved by families, groups, and friends who want common space and camaraderie. Daniel’s latest creation, The Club, is the icing on the cake for guests from all over the property to mingle, relax, listen to music, and soak up the unique charm and warmth of Barons CreekSide. In 2017, the new, incredibly beautiful vineyard between the cabins has been established! Nature plays an integral role in this Swiss-inspired Hill Country resort. Tame non-flying ducks swim up and down the bubbling creek, the owner’s 4 cats roam the property and greet the guests. Currently a roadrunner family patrols all 26 acres, and songbirds sing from atop the trees. Numerous whitetail deer, armadillos, squirrels, a few raccoons, and gray foxes have been known to frequent the landscape. We invite our guests to stroll along the nature trail to see what might be residing along the real Barons Creek, too. Barons Creekside was chosen by Cabela’s as their photo location for the 2010 and 2012 catalog. Woolrich did the same in 2014. Our guests can often be seen capturing the essence and beauty of our little mountain village with their own cameras and cell phones, too. Barons CreekSide is truly a feast for the senses. Daniel set out to create his own Swiss mountain village in Texas and has succeeded beyond his wildest dreams. He then met the native Texas Lady Deborah who shares his enthusiasm and passion for Barons CreekSide. This has become a place for memories to be made and stories to be shared. Special events, weddings, anniversaries, honeymoons, reunions, birthdays, proposals, retreats, various holidays, and more have been celebrated at Barons CreekSide. We are proud to see that a huge number of our guests are frequent repeats. They have truly become a vital part of the Barons CreekSide family. We cordially invite you to stay at Barons CreekSide and experience this slice of Swiss heaven right in the heart of Fredericksburg, Texas.